The birth of Lord Hanuman is celebrated as Hanuman Jayanti throughout India with much fervor and gaiety. It is celebrated during the month of Chaitra (March-April). Hanuman Jayanti is a vital celebration of Hindus. Hanuman is the image of quality and vitality. Hanuman is said to have the capacity to assume any frame voluntarily, use rocks, move mountains, dash through the air, cross through the air and rivals Garuda in quickness of flight. He is revered in the social convention as a divinity with supernatural forces and the capacity to vanquish malicious spirits. Hanuman who helped Lord Rama is his quest to eliminate evil forces is amongst the most popular deity of Hindu religion. He is said to be an incarnation or avatar of Lord Shiva. Hanuman represents strength, determination and loyalty. 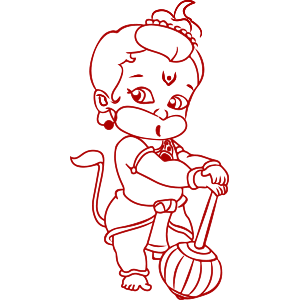 The birth fable of Lord Hanuman goes as: the attendant of Vrihaspati, the gurus of devtas, Punjikasthala was cursed to take the form of a female monkey and as a way to nullify the same, she was to give birth to an avatar or incarnation of Lord Shiva. She was born as Anjana and undertook a vigorous penance to please Lord Shiva. Lord happy with her penance granted her the boon she asked for. In the meanwhile, the king of Ayodhya, Dashrath performed a yagna to enable his wives to give birth to divine children. The God of fire, Agni, appeared and as a prasad of the yagna bestowed King Dashrath a bowl of sacred dessert to fulfill his wish. An eagle snatched a part of the desert and dropped where Anjana was meditating and the god of wind, Pavana, carried the drop into her hands. She gave birth Lord Hanuman after consuming the divine sweet. Lord Hanuman is also known as Rudra Avatar or incarnation of Lord Shiva and Pavana became his godfather. It was the full moon day of the Hindu month of Chaitra that Anjana gave birth to Lord Hanuman. On this day, every year, devotees throng the Hanuman temples and offer their reverence. People also worship Lord Hanuman to instill positive energy in one’s life and get rid of evil powers and spirits. Every year Hanuman Jayanti is celebrated on the full moon day of Chaitra (Chaitra Purnima) with traditional enthusiasm. Lord Hanuman is said to be born at Sunrise, thus, the celebrations in Hanuman temples start before the Sunrise and continue the whole day after sunset. Lord Hanuman is the symbol of loyalty and devotion. He possesses unmatched strength and is a great intellect. It is said that when Hanuman first met Lord Rama during his exile, who was searching his wife, Sita who was abducted by the king of Lanka, Ravana, in the guise of Brahmin. Lord Rama was so impressed with Hanuman’s intellect that he instantly commented that I have met a person full of intellect and embraced him. Lord Hanuman teaches a lot of things for living a happy life. His entire lifespan teaches us many things which might seem small give a lot of lessons for good living even in the present age of materialism. He teaches us devotion, how to master five senses of smell, taste, sight, touch and hearing, be faithful, become powerful yet be humble, readily help people in distress, how to overcome difficulties of the life. Lord Hanuman is the symbol of virtues as integrity, valor, intelligence, strength, patience and wisdom. He is supreme among wise touted as ‘bhudhimatam varishtham’. If a person imbibes Hanuman's three foremost virtues of the ideal bhakta; pativrata bhakti, Dasatva bhakti and Naishtika brahmacharya..one cannot face any difficulty throughout life. The character of Hanuman shows us of the boundless power that is unused inside every single one of us. Hanuman coordinated every one of his energies towards the love of Lord Rama and his undying commitment made him with the end goal that he turned out to be free from all physical exhaustion. What's more, Hanuman's just want was to bear on serving Lord Rama. Hanuman superbly embodies 'Dasyabhava' dedication that bonds the ace and his hireling. His enormity lies in his entire merger with his Lord, which likewise frames the premise of his amicable characteristics. It is elusive a character who is in the meantime so capable, so learned, scholarly, modest and interesting! Hauman is mentioned noticeably in the considerable legends of Ramayana and Mahabharata.